When thinking back on the previous 999 episodes of Raw, I debated on which moment would top my personal list of favorites. 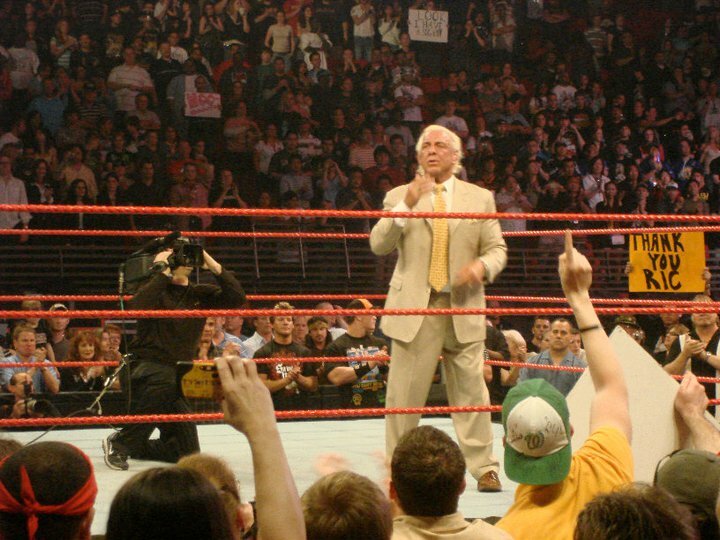 I chose Ric Flair's sendoff after Wrestlemania 24 for a couple of reasons. Probably the most important one is that I was there in the live crowd for it. Chad and I had attended Wrestlemania 24 and witnessed Flair's last match ever (or so we thought). It was an emotional night to say the least. We all knew in hearts that Flair was going to lose with all the hoopla around his Hall of Fame induction the night before, but it still stung when the referee counted three. The 16 time champ had tears in his eyes before HBK even connected with his Sweet Chin Music, so you can imagine what it was like when the match was over. Typically when we go to Wrestlemania, we leave the next morning. But for 24, we bought the Wrestlemania Package, which included tickets to Universal Studios. We decided to hit the park on Monday and spend an extra day in Orlando. 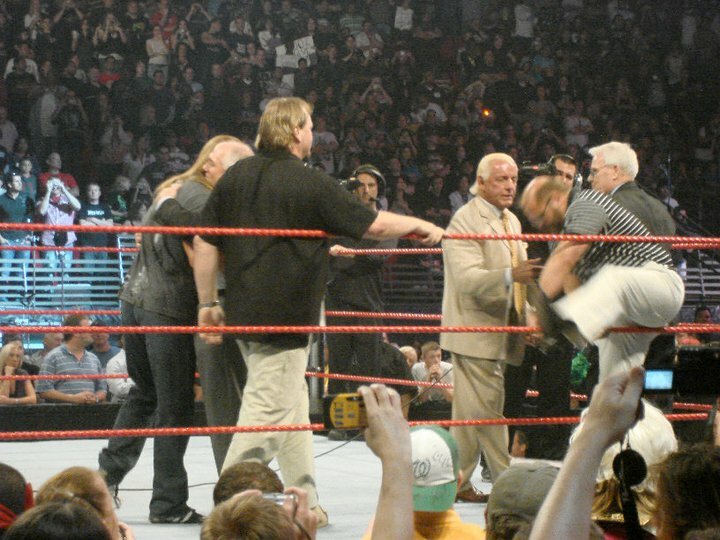 When we got back to the hotel late that afternoon, Chad read online that the Four Horsemen were going to be at Raw for Flair's official sendoff. Without hesitation, we decided to head downtown and see if we could get tickets. Much to our surprise, not only were tickets available, but they were good seats and really not at all expensive. The end of the show saw legends like Ricky Steamboat, Greg Valentine, Harley Race, and of course the Horsemen (JJ Dillion, Barry Windham, Arn Anderson, and Tully Blanchard) come out and say their goodbyes. I think it was significant that the Horsemen were there because I believe that was the first time the five of them had been together in nearly 20 years (in public). Stars on the roster like John Cena, Chris Jericho, Shawn Michaels, and Triple H also came out for the celebration. When Raw ended, the festivities continued. 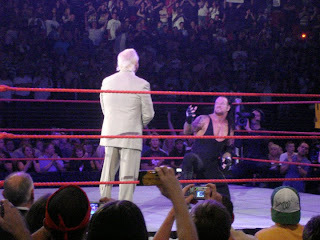 Vince McMahon and the Undertaker also did salutes to the Nature Boy. I'd say it would be hard to find a dry eye in the arena after all of the celebrating. It was such an emotional evening. Of course some of that emotion has been tarnished with Flair's decision to return to the ring. Never in the history of the business has anyone received such a lavish sendoff. I don't think it will ever happen again either. But I still feel fortunate enough to have been a part of that night. Woooo! Honorable mention: How can I list my favorite Raw memories, without mentioning the first ever episode. It was something new in terms of what we were used to seeing in the world of professional wrestling. Primetime Wrestling, Superstars, and Tuesday Night Titans were all taped shows with the hosts sitting inside a studio and talking about the matches. With Raw, it had a pay per view feel in terms of the "live" element. I know those early shows were recorded, but if you didn't know it was hard to tell. Vince McMahon, "Macho Man" Randy Savage, and radio host/actor Rob Bartlett made up the announce team. It was an interesting dynamic to say the least. 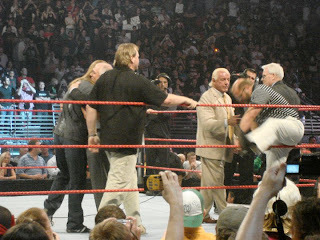 Bobby Heenan trying to get into the show was also a very entertaining aspect of things. Originally Raw was only an hour long. I don't think it was until the Monday Night Wars picked up that Raw added that second hour. Raw also started off with a lot of top talent versus enhancement guys. 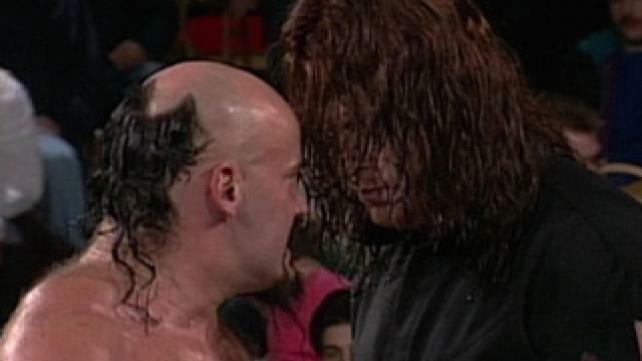 I mean, the main event of that first show was the Undertaker vs. Damien Demento. Shawn Michaels also beat Max Moon that night, and the Steiners Brothers were in action against tag team jobbers. Raw has certainly come a long way over the last 999 episodes and nearly 20 years. I'm already making plans to attend the 2,000th since I can't be in St. Louis tonight. For those who are there or on the way, enjoy the show. We'll be watching on USA tonight for My 1-2-3 Cents and From the Rafters Radio signs.